The College will celebrate Homecoming 2018 with a week's worth of activities from Oct. 8-14. 5 - 8 p.m. on the Science Front Lawn (rain location: Benedictine Commons in the Science Center): Old-Fashioned Minnesota Potluck. Students are invited to enjoy classic Minnesota dishes and outdoor lawn games hosted by campus Resident Advisors. 10 a.m. to 2 p.m., Duluth Food Day, Student Union. Sample local fare from some favorite Duluth restaurants. 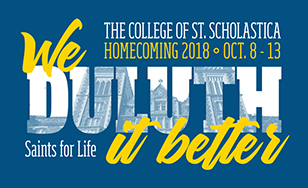 2:15 p.m. Campus Homecoming Parade - the parade will begin between the Science Center entrance and the entrance of Our Lady Queen of Peace Chapel, winding between the Science Center and Somers Hall, past the large parking lots at the front of campus, and up the hill toward the Burns Wellness Commons.